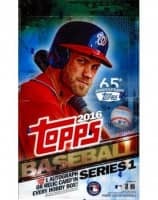 Factory Sealed 2016 Topps Series 2 Baseball Hobby Box mit 36 Packs Per Box, 10 Cards Per Pack. 1 Autogramm oder 1 Relica Card per Box. Produktinformationen "2016 Topps Series 2 Baseball Hobby Box MLB"
Factory Sealed 2016 Topps Series 2 Baseball Hobby Box mit 36 Packs Per Box, 10 Cards Per Pack. 1 Autogramm oder 1 Relica Card per Box. It's the second installment of the 2016 Topps Baseball set... cards 352-701! Collect all 350 cards, find amazing inserts and look for special new programs commemorating Ichiro's pursuit of 3000 hits and Ken Griffey Jr.'s monumental career. And look for "Double Play ", an all-new interactive trading card that gives fans and collectors a chance to win great prizes based on a player's performance! Key Rookies: Kenta Maeda, Brandon Drury, Kyle Waldrop, Peter O'Brien, Max Kepler, Frankie Montas, Socrates Brito. - TEAM LOGO PIN CARD - 35 players alongside their team logo pins. next to a replica pin from that game. - WORLD SERIES CHAMPION COIN AND STAMP CARD - 25 cards featuring champions of the Fall Classic and a U.S. coin and postage stamp from the year they won the title. - Chasing 3000 - 30 cards chronicling Ichiro's pursuit of 3000 hits in MLB. Inserted 1:9. - DOUBLE PLAY - To rip or not to rip??? These all-new interactive trading cards have a statistical outcome on the inner card. If your player achieves the predicted result on the card, you win!!! - "Tribute to The Kid" - Topps pays tribute to Ken Griffey Jr.'s career with this 30-card set. Inserted 1:8.
about the biggest stars in MLB, in the autograph and relic versions of this insert. BERGER'S BEST: This classic set continues from Series 1, and will feature another 65 memorable cards from Topps history. Inserted 1:4. HALLOWED HIGHLIGHTS: Featuring great achievements from 15 retired stars and legends. Inserted 1:8. 100 Years at Wrigley Field: Topps' tribute to the Friendly Confines continues in Series 2! Inserted 1:8. FIRST PITCH: This fan favorite set again returns in Series 2 with more notable names who tossed out the first pitch at a 2015 MLB game. Inserted 1:8. Bunt Code Card: Look for codes to unlock digital cards in the popular Topps Bunt app. Bunt Player Cards: Exclusive Topps Bunt cards only found in this product. Numbered to 25. 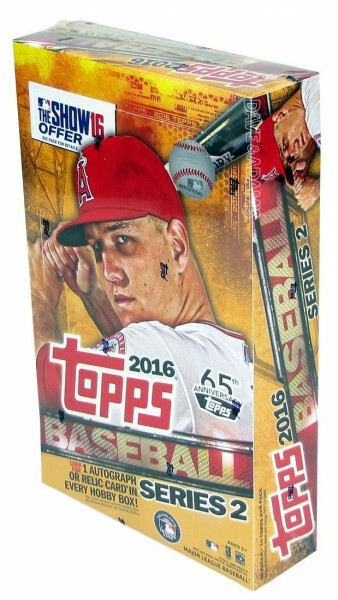 Weiterführende Links zu "2016 Topps Series 2 Baseball Hobby Box MLB"
Fanbewertungen für "2016 Topps Series 2 Baseball Hobby Box MLB"